Brush up on another take on current events via reinform.org - stuff you won't necessarily find in the mainstream media. No? 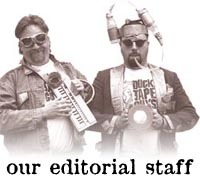 Well, how about if you could nab some genuine Duct Tape Guy props (retired), with books and videos to boot? 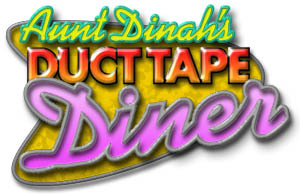 Click to see what our current offering on eBay is by clicking to our Duct Tape Guys on eBay page (items change without notice). Next up: Tim's Wallet - stay tuned! It's Stuck at Prom Time Again! The Duck® brand duct tape Stuck at Prom® Scholarship Contest once again challenges high school students to create and accessorize their prom formalwear with America's favorite fix-all - duct tape. And, for the first time, this year it's the public's choice as to who's got the hottest fashions. Online public voting will decide the winning couple from the top 10 finalists. The couple winning the first place title will recieve a $6000 cash scholarship for college! 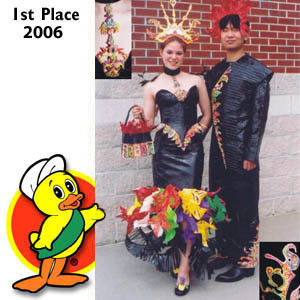 So, get your plans drawn up, go out and stock up on any or all of Duck® brand's 20 colors and patterns of duct tape and get busy creating YOUR winning prom outfit. 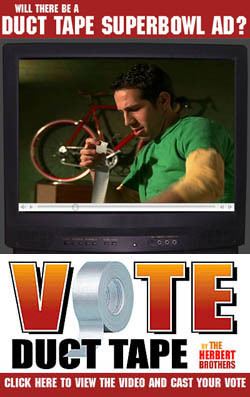 The contest will start on March 5th, 2007 (This is your advance warning from the Duct Tape Guys). Complete information is online at StuckAtProm.com and we will have more information in the March newsletter as well. For inspiration, visit our duct tape prom fashion gallery. 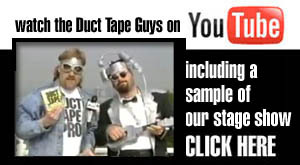 MAJOR IMPORTANT ANNOUNCEMENT FROM THE DUCT TAPE GUYS - RIGHT NOW! CLICK HERE! We won't ruin the surprise, you will have to watch the video. And, when you do, make SURE you tell your friends about it. Thanks - see you in a minute. My niece was looking at a catalogue of "Christian Underwear" and noticed one that said, "Do Not Remove Until Marriage". She said, "Man, that is going to stink!!". There is a national pizza delivery chain which has as a slogan "One Call Does it All". Isn't that normally how many times you have to call a pizza delivery place? I mean, it's not like you have to keep calling them over and over again until they finally decide to break down and bring you your pizza. Speaking of food, I bought a can of cashews and saw that, on the side of the can, it said, "Satisfies Hunger". I'll bet that the people who write advertising for other foods are kicking themselves for not thinking of saying that about their product. Just think of the market they could have had if they had only targeted people who buy food because they are hungry. Normally I like to pick one huge website which can give you hours' worth of things to pour over and which has an appeal to a specific audience. This month, I have given four rather short sites which will appeal to perhaps a wider range of people. First, for those of you with a literary bent, there is the One Look Reverse Dictionary. Among other things, this can help you find the perfect word when you are writing your novel. It also does quite a few more things and possibly you actually can spend hours putting in various things and viewing the results. Nevertheless, I am still going to give you the other three sites as a bonus... no extra charge. Thanks to Nick J. for two of the above (I will not reveal which two in order to protect the innocent). The Diner is Closed for Remodeling - back next month. A Baptist Preacher was seated next to a cowboy on a flight to Texas. After the plane took off, the cowboy asked for a whiskey and soda, which was brought and placed before him. Three Rednecks were working up on a cell phone tower  Pete, KC, and Cooter. As they start their descent, Cooter slips, falls off the tower and is killed. As the ambulance takes the body away, Pete says, "Well, damn, someone should go and tell his wife." KC says, "OK, I'm pretty good at that sensitive stuff, I'll do it." Pete says, "Where did you get that beer, KC?" "Cooter's wife gave it to me," KC replies. "Well, not exactly," KC says. "When she answered the door, I said to her, you must be Cooter's widow." She said, "You must be mistaken, I'm not a widow." Then I said, "I'll bet you a case of Budweiser you are." Yesterday I was having some work done at the car dealer. A blonde woman came in and asked for a seven-hundred-ten. 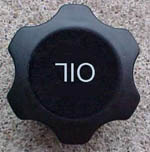 They all looked at each other, and the mechanic asked, "What is a seven-hundred-ten?" the piece looked like. She drew a circle and in the middle of it wrote 710. He then took her over to another car which had the hood up and asked, "Is there a 710 on this car?" She pointed and said, "Of course, it's right there."